The Campaign are happy with the move and feel that the new shop represents a more effective location for the organisation than the previous one. 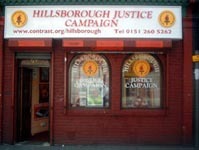 The Hillsborough Justice Campaign Shop is now located at 178 Walton Breck Road, opposite the Albert pub which will help give the campaign more visibility as well as making it more accessible to supporters. The shop is open normally 2 – 3 hours before kick-off for every home game. The shop is also open for a short time after the game. Everyone is welcome to call in and talk to members of the Hillsborough Justice Campaign team and meet fellow Reds. Please make the HJC shop your rendezvous point for meeting your friends before and after any Liverpool home game. Upstairs, there is a large meeting room at the front. On match days, people can sit and have a chat with members of the team. The meeting room includes a kitchen area, with facilities for making hot drinks. Lavatory facilities are also available. There are many items on-site for you to purchase - books, badges, a variety of T-shirts, posters and many other items. All monies raised will go towards the Campaign for Justice and for the upkeep of the shop. 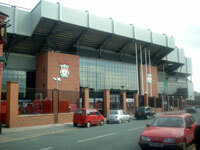 There are many pictures on the shop walls relating to Hillsborough and Liverpool FC in general. These extend into a walkway at the rear of the shop. At the rear of the shop, plans are in place to erect a garden of remembrance. The shop is also used as an office for the campaign, our meetings are held there and it also functions as an informal drop-in centre where members can offer support and advice.Skills gathered through years of experience in community activism and involvement means that the shop is used as a facility for the community in a broader context.